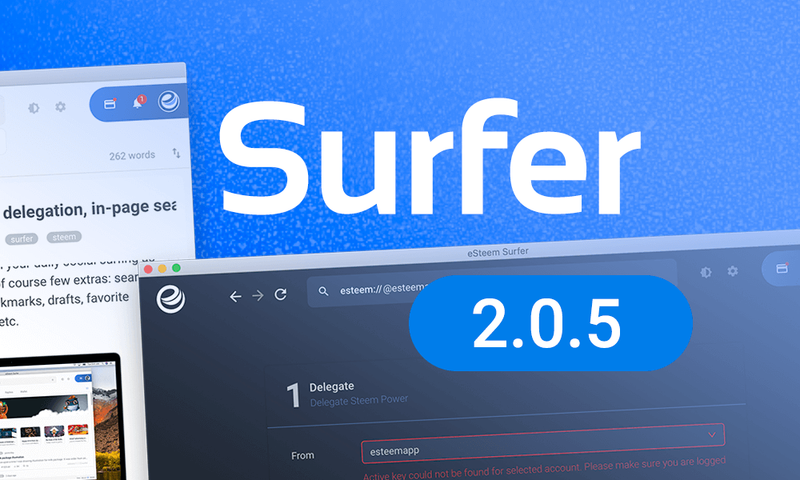 Fresh Surfer 2.0.5 build is ready to download! What it it? 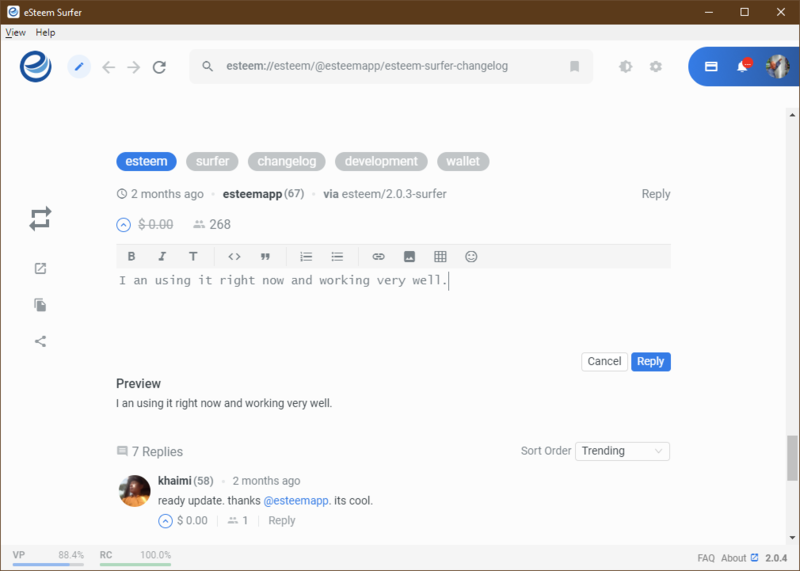 It's a Steem Desktop client (available for Windows, Mac and Linux) with many handy features. In this update we've implemented delegation support, long awaited in-page search, fixed and tweaked a lot of things and added few small details like power down amount display in wallet, recent usernames list in transfers etc. Finally you can delegate any amount of your Steem Power to any user using your eSteem Surfer wallet page. 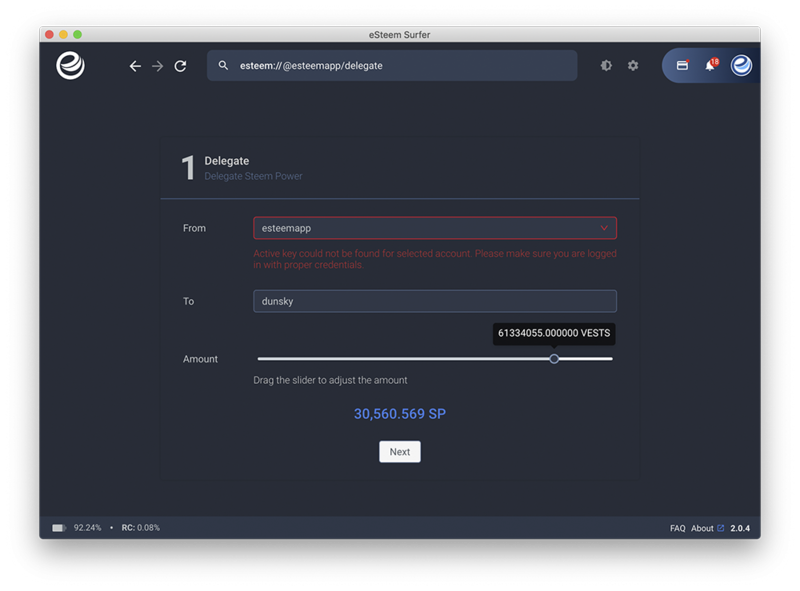 If you are wondering how to undelegate and get your Steem Power back just initiate another delegation transaction to same user but enter zero amount for that transaction. Just press Cmd/Ctrl+F and start typing anything you want to search in current page. 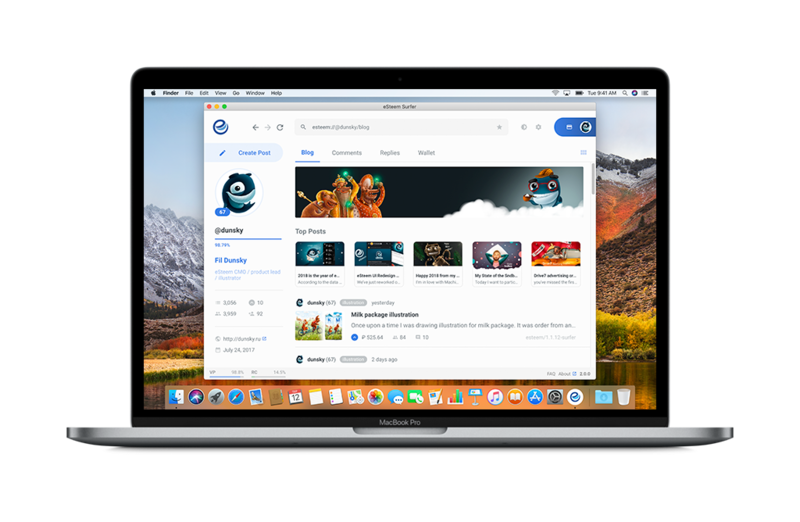 You can do it in your feed, inside any post/comment section, inside your editor during writing a post or even in the wallet searching for particular transactions. Superhandy! Special thanks to our translators and proofreaders to helping us to present you Surfer in your native language! We will enable new languages and updates in each release. Thanks a lot for super-fast response and merging. I believe open-source project should be more open to external contributors like you did. I'll keep contributing. I believe I can do since I've been contributing to Busy and I made my own bot. If I keep contributing, I'd really appreciate if you would follow me :) I'm kidding but actually it'd be fun and good incentive for contributors. roadscape kindly followed me after I contributed some on steem :) It was great! But please don't feel pressure (especially since you're not following many). Many thanks for the great project. We have just pushed update of 2.0.5, can you re-download and try it out? Sure and thanks a lot for following! Great, now it shows as 2.0.5 (including SBD :) but still comments tab doesn't work for me. all other tabs are working so I don't think it's a network problem. maybe deprecated api use? I guess you're a dev for esteem? 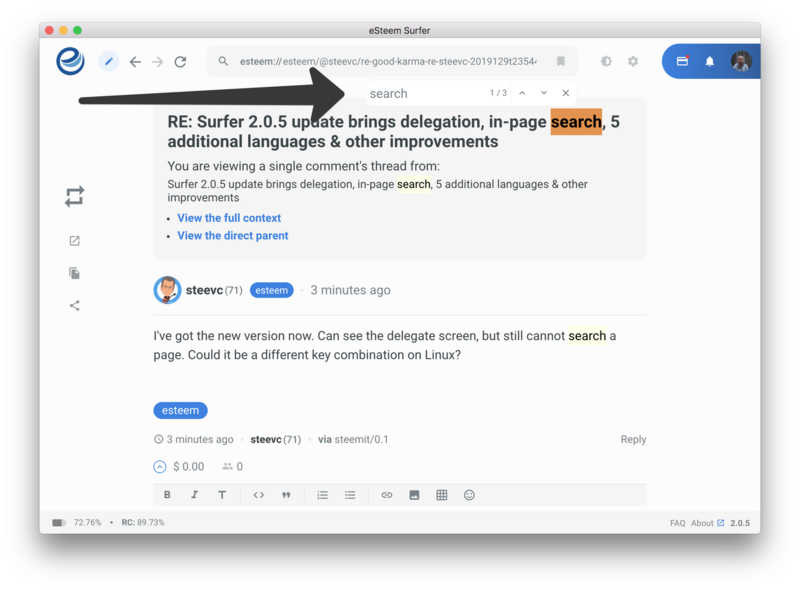 Hope https://github.com/esteemapp/esteem-surfer/issues/196 will be resolved as well. Thanks! Sorry for the late reply, I've been busy. I'm not a developer for eSteem. It’s great seeing you contributing to the eSteem development. I've just voted you for witness. While I knew esteem mobile is widely used, I'm not a mobile user. So I actually realized today that you're actually running this, and the mystery of your high ranking has been finally resolved :) Sorry for being late and not interested in steem politics. But actually witnesses should advertise and communicate more. My voting is only 12k including proxied, but I'm a person who believes the power of small :) While top witnesses might be determined by only a few now, hope that'll change in the future. Thanks. Great Update! We're trying out the new Esteem Surfer on desktop right now! Great work once again @good-karma ! You and your team does great work and continues to make progress. If I had it my way I would put you in charge of Steemit Inc to turn this whole ship around ! Esteem is fun to use both Pc and mobile. Lately I have used the one from the PC. Glad it has its own interface away from ads and pop ups. But glad I am supporting esteem with some small beneficiary rewards which are well deserved! Having problems with the current version! Appreciate all the hard work your are doing! @fullcoverbetting, could you elaborate on issue you had? we just updated 2.0.5 version, could you try to download and test it? It keeps loading my feed. Can you tell me wherr I can download the latest iphone version. Then I will try it out! This post is about eSteem Surfer, desktop wallet application and its update. Screenshot you have is old/legacy version of eSteem Mobile. We are in process of releasing eSteem Mobile v2 for iOS. Android v2 is out already, iOS will follow soon. If Feed keep loading, please check Settings and Server option inside app and choose one of other servers and try again. It is likely server connection issue. RE-steemed! I have not tried this interface yet, but the delegation functionality seems very useful. I find it amazing how much dApp development is going on in this bear market. Give it a try, I assure you, you will love it! Hi @good-karma, I'm @checky ! While checking the mentions made in this post I noticed that @charlie7 doesn't exist on Steem. Did you mean to write @charli07 ? I’m using Surfer on my linux PC and it works perfectly, waiting for V2 Update on iOS. Glad to see its ready and you are waiting for apple confirmation. Nice to see delegation feature in new version which was missing in last version. It seems to be working smoothly on Windows 10. Should add "Copy Links" to every links because sometimes I want to paste the link to like Discord. It's already in todo list, thanks! That's still old version. The latest version is 2.0.5, this shows on the bottom right. Can you implement an update command directly in the app? Update command? App notifies you when an update is available already. No, to update within the app. Yes, you can do that. When you get update pop up, click on download. Oh, really? I've never seen that pop up. I'll have to check. Indeed. Very nice. Never seen it before. Wow! This is great news @good-karma. Your UA account score is currently 8.480 which ranks you at #2 across all Steem accounts. In our last Algorithmic Curation Round, consisting of 238 contributions, your post is ranked at #3. Congratulations! @good-karma it is cool but I am expecting it not be too heavy or loading all the time, do you understand what I am saying? ps. App is still in Beta so expect weekly update before the final release and expect iOS versoin in few weeks! Yes I have used previous versions if esteem. But found it very unstable. When posting it would freeze or crash my phone. And after writing a long blog It was very anoying to lose it all. So I lost trust and find partiko far superior and very relyable. You should give it a try. The errors highlighted above do not occur in the new eSteem Mobile App v2. Download, Enjoy and Give your feedback. Good! Please keep your eyes on it. I'm gonna install it now on windows and see how it works. I don't know why the comments section is not loading perfectly? It's loading in the browser, but not in the application. Very interesting news form this post ,I appreciate you .. I just installed the deb on Ubuntu, but it still seems to be 2.0.4 and the search is not working. That's a feature I've been waiting for. Hey, @steevc, give us few minutes... looks like release took old version without merging new changes. We are in process of re-uploading correct build. I've got the new version now. Can see the delegate screen, but still cannot search a page. Could it be a different key combination on Linux? I believe Ctrl+F should work, I will ask team to check it on Linux... What distro of Linux are you using? Btw, you should see following type of search field to find text on page. @steevc I did that too but it is extremely heavy, any suggestions? @fareed24, could you elaborate more on what part of application is slow for you and which pages do you think should be lighther if you feel navigation or loading slowness? Thanks, your feedback might be crucial to future improvement of the app! @good-karma the application is inncreadible and it is not slow, I am saying that my processor is slow and is there any counter to that? nice integration as now we don't need to go to steem bot tracker as we can now directly do delegation from it. I like the improvements and I look forward to coming, @good-karma. 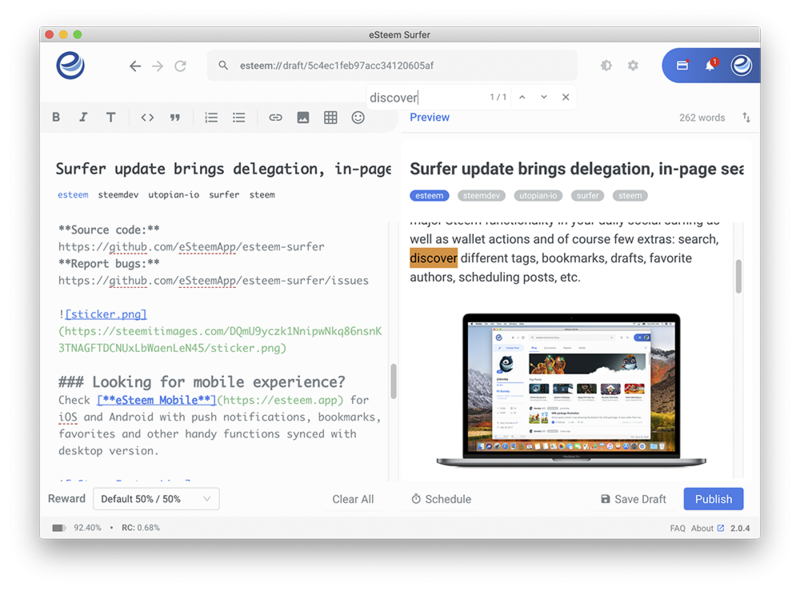 I'm only using Surfer and now I'm in version 2.0.5. I want to use the opportunity and to point out some of the issues I have noticed. I can not choose favorite people, disappeared that icon with a heart ... or maybe I do not know where to look! I can not see the list of people I'm following or the list of those who follow me. The number of followers or follows is not clickable. I hope to send useful information, if I'm wrong (and somehow it is my laptop's fault), please forgive me. I’m using Partiko to make friends and have fun on the Steem blockchain. You should as well! Here’s my invite link: https://partiko.app/referral/champion-king, you will get 3000 Partiko Points for sign up bonus, and you can exchange them into Steem token! how about a anonymous browsing ? @good-karma Hey :) I am uploading videos, and I'm using your App and what I noticed is that every time I'm sharing a video the thumbnail does not show up as a picture but instead is taking the first picture which I am sharing or in my case only the banners. I attached a screenshot. ! I have to change some things on steemit.com so that I can see the "real" thumbnail. This is awesome, you guys are working hard to perfect the system .Good work guys.